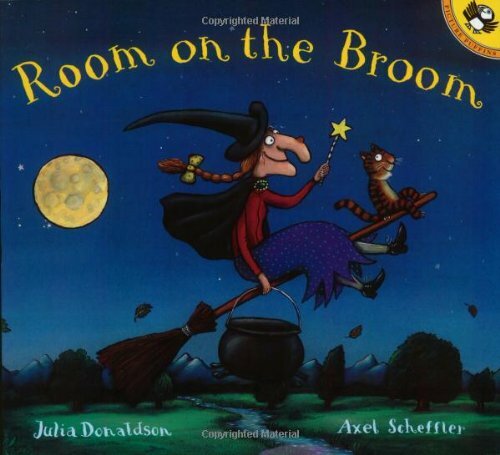 Every young child will enjoy Julia Donaldson's story about a witch and the adventure she has when she decides to take a ride on her broom. It is written in rhyme which is fun to read and children love the sing song quality of rhyme. There is sequence and some predictability within the story as the witch meets various animals. Once the children understand the pattern they may be able to help with part of the story. There is also an episode with a "ferocious " dragon, but the animals rescue the witch. The witch uses her problem solving skills to make a new broom too. So lots of interesting parts of this adventure for you and your child to enjoy together. Axel Scheffler's illustrations are full of detail. The facial expressions on the witch, animals she meets, and even the dragon will bring smiles to your face. I believe this is a story your child will ask you to read often.